Modern Treasury combines payment systems and ledgers into one platform to move finance forward. Your finance team should be focused on growing your business, not tracking down unknown payments on your bank statement. 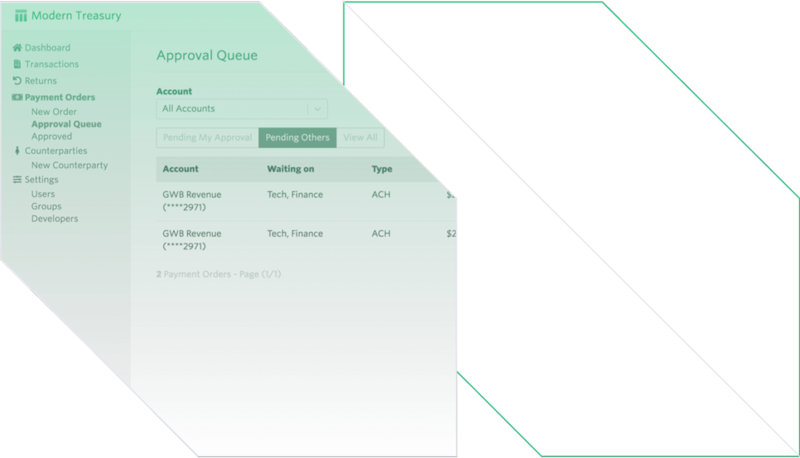 With deep support and banking integrations, Modern Treasury provides a platform to manage payment operations from simple payouts to customer service and accounting. We preserve your business context and safeguard your team's time, so they can focus on what you are building. Powerful Technology. Moving Finance Forward. For ease of development, Modern Treasury provides both live and test environments for end-users. Contact us with additional product requirements. Modern Treasury integrates with your bank on your business’s behalf. Connect your bank account to start processing payments with ease. Give your team the best tools that they can trust. © 2019 Modern Treasury Corp.